There are hundreds of these butterflies outside now. They're tiny, only an inch or so across, but they gather into swarms of 20-50 or more. You can be walking along and accidentally disturb them and they'll all start fluttering around you. It's really neat, but there's so many of them and they're so small, it's hard to avoid stepping on them. I know I've killed a few of them accidentally; they've gotten too close to the water buckets while I was filling them, they've been trapped in the garage, and I'm sure I've run a few over with the car. I think they're Eastern Tailed-Blue butterflies, but I'm not really sure. I haven't been able to get a photo of them with their wings open, but they appear purplish as they flutter around. Those have a dark grey upper wing, these are more purpleish. The marks on the underside of the wing seem to match http://www.cirrusimage.com/butterfly/eastern_tailed_blue_2_med.jpg almost exactly. I stand corrected. 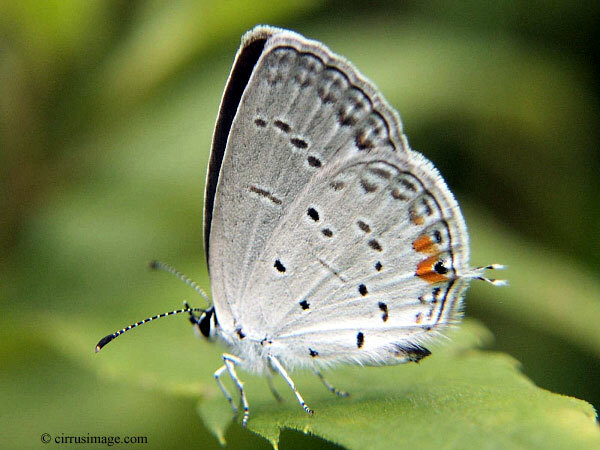 Incredible consistency of coloration and arrangement of markings across the subfamilies of the Lycaenidae. http://en.wikipedia.org/wiki/Lycaenidae What's going on here? What are we missing? It looks like Batesian or Müllerian mimicry.